I first learned about Grayl while attending Natural Products Expo East. Grayl creates water bottles with a French press style filter. Their product is unique because not only is it a water bottle and water filter, it will filter out nearly anything. Including viruses – which not all filters can actually do. 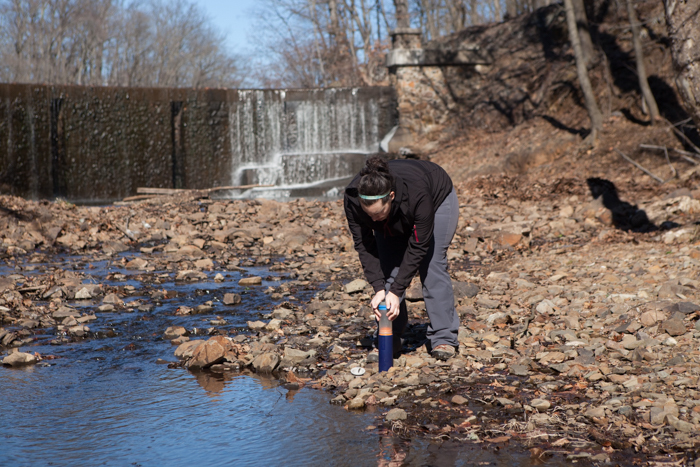 Some filters are may be similar but aren’t nearly as quick to filter water. For my backpacking trips I own a more traditional backcountry filter pouch. Though this pouch allows me to directly filter into my water bladder. It was a 2-step process to get it into my water bladder or bottle. 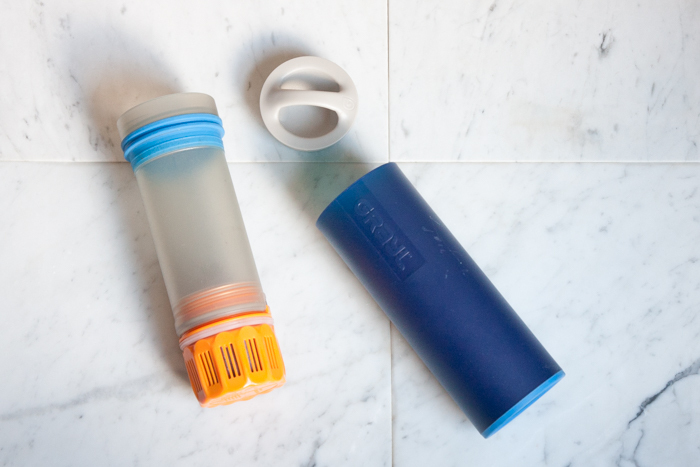 Grayl’s filter bottle allows you to filter water while traveling abroad. Perhaps you’re in a foreign airport and don’t have the ability to do a water transfer without holding up the water fountain line. 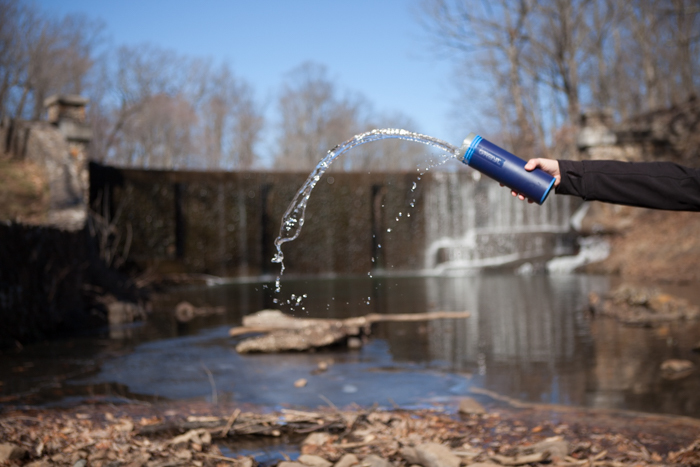 Grayl’s filter bottle is very convenient with the built-in filter, which can filter 16oz. of water in 15 seconds. Fill the bottle, place the inner filter and just press. You can do this easily with only your body weight and flat area to place the bottle. I wish this bottle had a larger capacity. Especially since only 2 cups of water is only enough to cook one freeze-dried meal. Grayl’s small capacity filter bottle seems to encourage you to actually drink much of your water at the water source since it is smaller than most filter bottles or pouches. My Grayl filter bottle has given me no issues regarding leaking and that’s a feature I love! As long as you secure the filter correctly on the bottom and tighten the cap you can toss it in your bag and not worry about the bottle needing to stay upright. 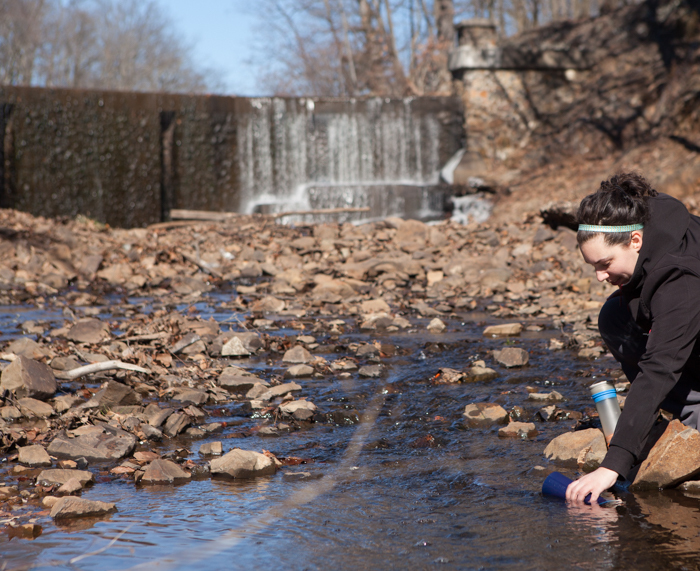 You should always try to filter water from running sources and certainly not algae covered ones. However, Grayl is up to the challenge if your only option in an emergency situation was a pond covered in algae. The Grayl Purifier Filter cartridge is made for global travel. It removes pathogens (viruses, protozoa, bacteria), even heavy metals and chemicals. Because of this I would completely trust this filter for any sketchy water situations in a pinch. When I am on the trail I sometimes found that I want put down the filter and inner press so I could fill the outer (re)fill with two hands. However, it felt weird to place either end of the inner press on the ground. Since I try to keep my adventure products out of the dirt as much as possible especially if I’m going to use them to eat or drink with. Maybe I just need to carry a small lid to place it on for those few moments? If it’s dry, sure I can toss it in my pack but it usually isn’t. The filter can hold extra water once the inner press is emptied. Now, if you live in the city as I do, then you might find your water to taste a bit metallic or chemical-filled. I never realized mine had tasted so terrible until I drank spring-fed water in Tennessee for two straight weeks. That is some of the best tasting water I’ve ever had, it was so delicious! I was even thrilled to enjoy free potable water within the Smoky Mountains National Park. So when I returned home I couldn’t even enjoy my tap water without it tasting overly metallic to me. That’s why I was glad Grayl makes a Tap Water Filter cartridge. It helps to filter out chemicals like chlorine, iodine and heavy metals like lead and arsenic that were leaving me with a bad taste in my mouth. This filter is super fast too, you can have your filtered water in 7 seconds and has a lifespan of 300 uses or 40 gallons, as does the purifier cartridge. 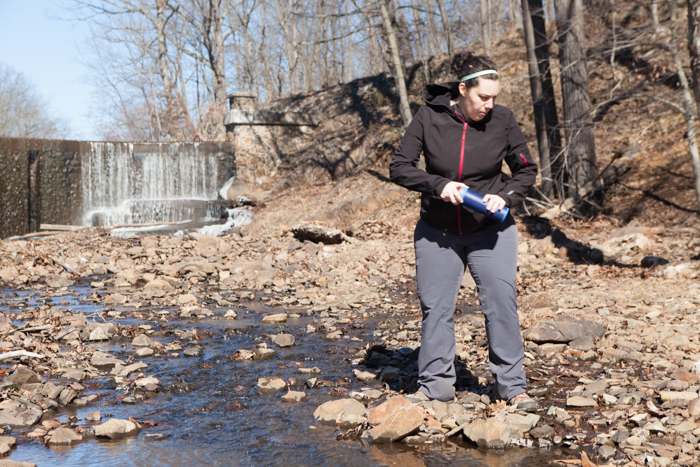 Whether you are a full time or part time adventurer or just want an on-the-go way to filter safe water. Grayl has the right bottle and filter for you. All four colors of their ultralight bottles are made from BPA-Free plastic. So, when your bottle has reached the end of its life, it will be recycled just as any other #5 plastic can be. I prefer to recycle my #5 plastics at my local Whole Foods. So that Preserve Products recycle program can continue to create recycled plastic products.